Today, November 11, 2018, marks the centennial of the end of the Great War (1914-1918), a horrendous conflict that erupted accidentally. Requiescant in pace. 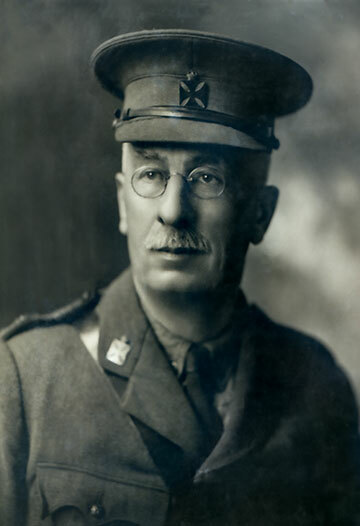 Ancestral military service: In addition to my grandfather’s service during the Great War, my father, R.T.Fraser, served in the Second World War from 1940-1945. Further, my great-great grandfather, Hugh Fraser, served against Napoleon in the Peninsular War, c. 1810, and against the Americans in the War of 1812. My grandfather, Thurlow Fraser, served in the Battle of the Somme (1916), was wounded, and was mentioned in dispatches for bravery. Further, many of his and his wife’s relatives were killed or wounded in the conflict, and he expected to be killed. Indeed, at one point, he bent over to help a wounded soldier and a bullet passed over his crouching body killing another person behind him. Rev. 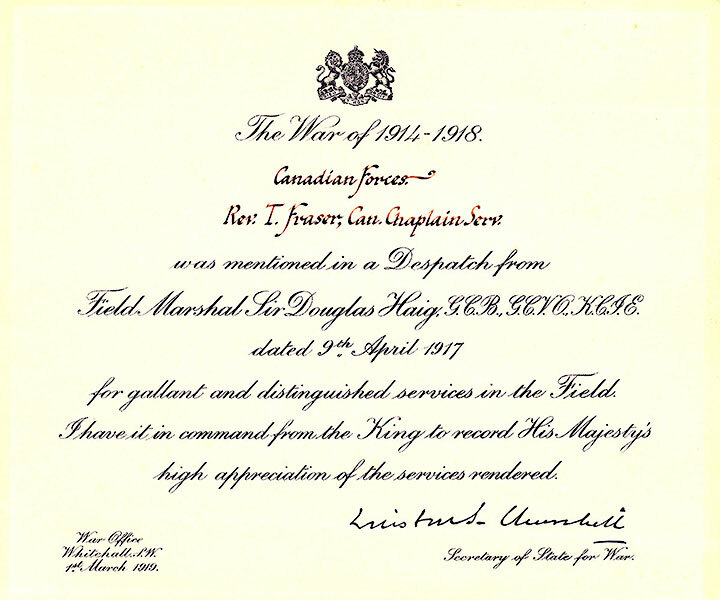 Thurlow Fraser was 45 when he enlisted. • His cousin, Rob Fraser Langford gave Yasodhara its name (the site of the ashram). But I live here, and that has to count for something. So, this is personal. If the letter offers anything today, it is a poignant record of the horror of this century-old conflict. I cannot let this year which has brought you so much sorrow, pass out without writing you a few words of sympathy on the loss of your son, Allan. Although I was in the battle that day, Sept 26th and probably not far from where he was, I did not hear about his being wounded until weeks afterwards. In a battle such as we had on Sept. 20th, 26th, 27th, we know nothing of what is going on except what we are able to see with our own eyes. There is the continual roar of guns, so that we can only make a comrade hear by screaming in his ear. Shells are howling through the air and bursting all around us. Men whom we know, and men whom we do not know are being killed around us. On that day men who were so close to me that they were touching at the moment they were hit, were killed. The probability is that we will be next. We do not think of running away or even taking cover. Our work has to be done. So we go right on, doing whatever our hands find to do. That day I saw some of my best friends wounded, and some killed. I chanced to be there at the moment, and was with them when they died. But, others were hit within two or three hundred yards of me, and I did not know it. One of my own nephews was corporal in charge of the signallers on a battery not over 200 yards from where I was, and I never knew he was there until I met him this week. That is how it was with Allan. He was not far from where I was helping to care for the wounded. But I did not know it till weeks afterward. I know what a blow it must have been to you. He was young, and his life full of promise. Yet it is just such lives that this war is taking all the time. It is reaping a harvest of the young before their time. And yet short as these lives are, they have lived longest who have lived best, and died for what is worth while. I feel that those brave young fellows are dying for what is worth while. They feel it too. Much as they hate the war, and much as they would like to get home, they would rather go on fighting and taking their chances of getting killed, than see a premature peace which would simply bring in its train another war. They all say that they would rather finish it now while they are at it than have to start over again. I have had six nephews in it. One was killed in November; one was wounded about the same time and is in hospital. The other four are carrying on. Of six cousins of Mr. Fraser’s, who were here in April, there is now only one left. Three killed; one wounded and disabled; one a prisoner in Germany, one still fighting. I have so many other relatives in it that I have ceased trying to keep track of them. I know what this thing means. But, I would rather see it fought to a finish, than ending by a compromise which would leave things in the same bad old way. I hope Howard is keeping well and safe. Of late I have been separated from the Owen Sound boys. So long as I was anywhere near there, I kept in touch with them. But of late that has been impossible. I do not even know where they are at present. Our units are forever shifting; and they are all with different divisions from what I am. In your affection and sorrow, you have my deepest sympathy. May God comfort you, and give you strength to bear it. Finally, I include his “Mentioned in Dispatches” signed by Winston Churchill. This entry was posted in commentary, history. Bookmark the permalink. 12 Responses to Great War, R.I.P. Wow! Thank you for sharing your families’ contributions to the history of our country. Alistair…a very poignant start to this Remembrance Day for me, to read your post, and this amazing letter, and to reflect on. A thoughtful and well written letter about the horrors of war, and lives lost, and sacrifices made. Thank you for sharing this story, and it`s time and place in the history of war and human affairs. Thank you for sharing Alistair. A most poignant and memorable post. Thank you Alistair. thank you for this remarkable document. Apparently, your grandfather served as Chaplain in the army. I have just learned from the news on my smartphone that there is a Memorial Cemetery in Dieppe, France, were over 700 Canadian soldiers are buried. My own grandfather also served in World War I as a soldier, his rank unknown to me (I have no documents of these times). As both a German and an Austrian citizen I feel deep sorrow for this sad history because our former Emperors were the ones to begin World War I, without any good reason. Soon after the end of World War II, Romano Guardini (professor for theology and philosophy at Munich University) had given a public speech about the ‘fault of the German people’. When in school (around 1956) I had, in the course of our history lessons, to give a presentation of this speech and to discuss it. Guardini argued as follows: When a member of my family has committed a crime, I can say: I am not guilty. However, I cannot say: It does not bother me. Today I still feel considerable shame for my former German and Austrian fellow citizens who pushed Europe (plus various other nations, including Canada) into these wars. As Macron has put it today: The only good war is the fight for peace. So thank you again, Alistair, for your fine personal document. And, with respect to the millions of deads, we may wish ‘requiescant in pace’. Michael, I have known you for nearly fifty years. Yet, in all that time, I lacked the presumption to enquire into your take on the great European conflicts of the twentieth century. I greatly appreciate your having told me these things. Thank you Uncle Alistair for posting this. A view into the horrors of war and from my great grand father. I have shared this letter with a few of my friends here in Haiti after we held our minutes of silence at 11am this morning. With love. Kristina, there is something about viewing a catastrophic historical event through the eyes of one’s own ancestor to make it compelling. The causes of this war were monumental conceit and bad judgment. Thousands suffered because of it. It was immorality par excellence. At a time when democratic rights and freedoms seem to be slipping away unchallenged, it’s sobering to reflect at what terrible cost they have been sustained by those who came before. Thanks for the somber reminder. Trevor, I had qualms about a posting that departed from my usual fare exploring the natural world around Kootenay Lake. Apparently, my temporary lapse into human affairs is somewhat acceptable. It’s powerful to think about great-grandfather’s letter again in the broader context you provide. His descriptions of chaotic violence, tremendous suffering, and needless loss of life underscore the ways he and others survived by pure chance. Despite the disheartening irony, I do admire the sentiment his letter evokes: the hopeful persistence of individuals who were persuaded to enlist and bravely shipped out with the goal of bringing an end to *ALL* war.